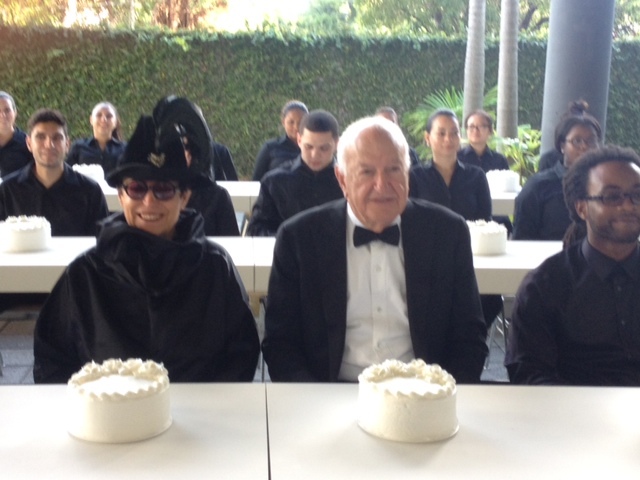 The food installation created each year by Jennifer Rubell for the Rubell Family Collection is an annual Art Week highlight. This year's is particularly personal. 50 cakes sit on long white tables in front of black-clad servers. In the center: parents Don and Mera Rubell. As visitors approach, the Rubells and servers feed them cake in a spoon. All 50 cakes --- chocolate, strawberry and vanilla -- were baked fresh this morning. The installation and exhibit celebrates Don and Mera's 50 years of marriage and collecting.